Bobcat offers a new level of versatility and efficiency. The Bobcat Rotary Telescopic Handler range will offer value as a Telescopic Handler, an Access Platform, and a Crane (3 applications offered in one machine). This flexibility and versatility will allow more variety of work to be completed in less time with one machine. The range offers the chance to do so much more on your site, with attachments that make it a three-in-one solution. Attach one of our man platforms and use it as an aerial work platform. 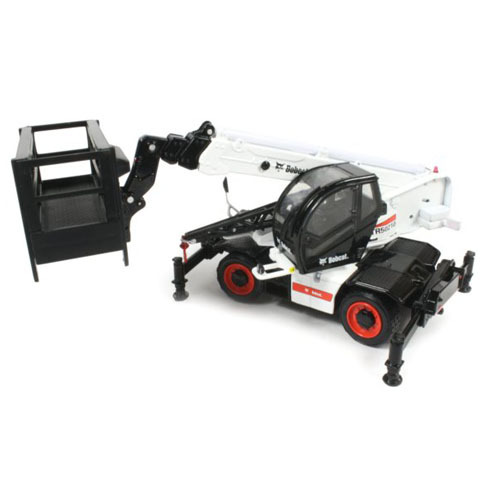 Use it with pallet forks or buckets, and it’s a telescopic handler. Add a winch or jib, and it becomes a crane… The possibilities are nearly endless! The rotating capability of the new Bobcat roto telehandlers allows the machines to serve the needs of an entire site from just one position. Capable of being set up in a matter of minutes, they offer exceptional stability for lifting heavy materials either vertically up to a roof or horizontally onto the edge of an excavated site, reducing construction time and costs and increasing safety and efficiency on site. The TR50210 model has four-section booms, offering maximum lifting heights of 20.5 m.
With the new range of rotary telescopic handlers you now have access to applications above 17 meters reach, while having the flexibility of 360° rotation* to improve reach and accessibility. The high lifting capacities offered will ensure more versatile, efficient and safe use. Complete more work in less time: compared to rigid frame telehandlers, the Bobcat rotary telescopic handlers allow users to cut by more than half the time it takes to complete repetitive jobs, even without moving the machine from the stabilizers. This not only ensures vast efficiency gains but also promotes safe working practices and overall site safety. Drive the Bobcat rotary telescopic handlers all over the job site and access even the most confined spaces, thanks to the machines’ excellent manoeuvrability. 1. Front-wheel steering for road travel; gets you to your next site quickly. 2. All-wheel steering gives you better on-site handling and a smaller turning radius, for sharp turns in small and narrow spaces. 3. Crab steering lets you position loads to the side with perfect precision in cramped areas. Combined with the vast range of attachments the rotary telescopic handlers become even more versatile with dramatic advantages versus a crane and access platform. A lot of attention has been paid to the machines’ reliability and aftermarket support. The four rotary telescopic handler models use the best components in the industry, coupled with a high level of workmanship and proven reliability, contributing to low operating costs throughout the machine’s lifetime. All four rotary models are standard equipped with man platform settings. No specific options are required to fit any of the 14 man platforms offered. The easy-to-use, heavy-duty hydrostatic transmission allows accurate positioning for greater safety and precision, as well as continuous speed control. All the models in our range can be equipped with radio remote control. Get more done, by remote-controlled boom functions. Travel time is downtime for construction equipment. But our machines can move quickly from one job site to another, and are back to work in no time. Through the load sensing control the management of stability is simple and safe. The four independently controlled stabilizers allow full stability even on uneven ground. Once deployed, transmission is automatically cut to enhance stability. In addition, locking of the rear axle occurs automatically at angles in excess of +/- 15° of rotation ensuring maximum stability during rotation. An oversized cab provides generous space so the operator can work comfortably all day long. 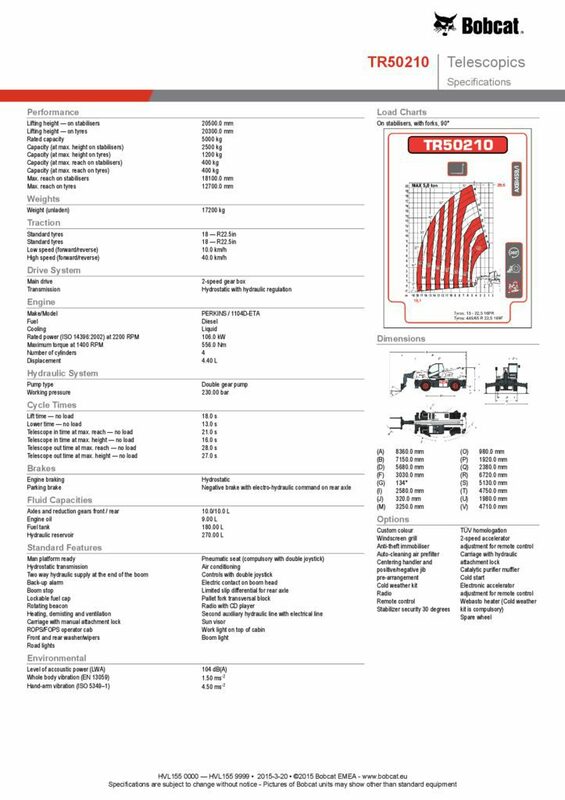 The instrument panel is designed to allow an easy overview of the machine’s operating status. You’ll find all the components and service points in the same, easy-to-access place on every machine, thanks to the common platform and consistent design. Maintenance is a breeze and downtime is reduced. Our well-developed dealer network has the knowledge and experience to take the best care of our Bobcat customers. No matter where you are, you’ll get the service you expect – and can rely on!